If you're booking salmon fishing in Scotland and want to truly 'cut to the chase' for not only obtaining the best professional advice on where, when and why to fish a particular salmon beat but also receive a few valuable salmon lie insights before you even arrive at the river then look no further. 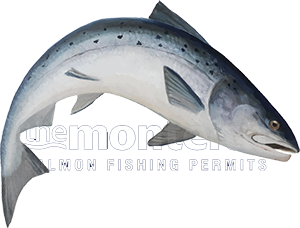 Preparation in salmon fishing to align yourself with success or a very strong possibility of it extends much further than blindly buying a salmon ticket and turning up at a venue with or without the correct equipment and fly selections and no clue as to where your best chances of sub surface cooperation are to be located. Dealing with an agent who eats, sleeps and breathes this business who as importantly has professionally 'walked the walk' on the riverbanks of Scotland will logically give you a colossal fishing day advantage. You wouldn't take a driving lesson from someone who couldn't drive so why on earth would you buy a salmon ticket from at best an amateur salmon fishing agent when you could deal with one of Scotland's true professionals. Even these days now that I'm off the tools following decades of professional riverlife I still get a huge 'buzz' from knowing my salmon beat fishing advice has brought a fish to the net for someone. I am a walking, talking encyclopedia for Scottish salmon fishing advice and there to be fully utilised by anyone who wishes to approach a salmon river with 'the edge'. The above shot is of the fabulous March Pool on the Upper Kinnaird salmon beat of the River Tay which shows the 2 main taking spots and the exact wade line so the salmon don't see you coming and are only ever first aware of your salmon fly. This fantastic fly pool at the mouth of the River Tummel is an absolute 'topper' during April & May while the River Tummel salmon run is in full swing for obvious reasons.